It’s been a while since I wrote about naviseccli and I admit I’ve missed it. I once wrote about using naviseccli to identify MirrorView ports on a CLARiiON array. Normally the MirrorView port is consistently located, but in that example we’d upgraded from a CX3-80 to a Cx4-960 and it was in a different spot. Oh how we laughed when we realised what the problem was. Anyway, we’ve been doing some work on an ever so slightly more modern VNX5300 and needed to confirm that some newly installed iSCSI SLICs were operating at the correct speed. (Note that these commands were run from the Control Station). 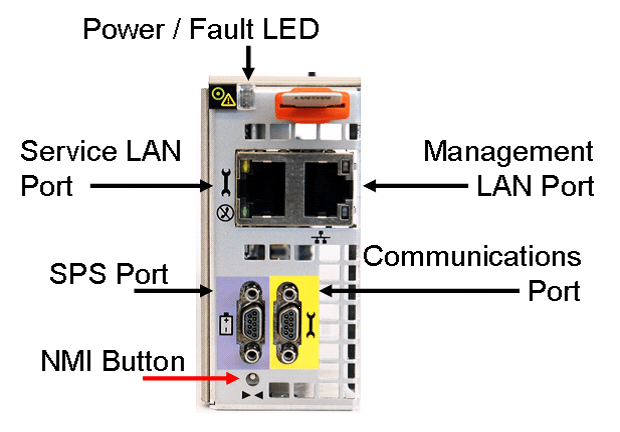 If you have a lot of ports to check this may not be the most efficient way to do it (ioportconfig may be more sensible), but if your network team are reporting on one particular port being an issue – this is a great way to narrow it down. Approximately 4 or 500 years ago, I spent a number of nights in various data centres around the country upgrading customers’ CLARiiON arrays from CX200s to Cx500s, CX300s to CX3-20s, and so on. The neat thing about the CLARiiON was that EMC had a pretty reasonable way of doing data in place (DIP) upgrades, including across generations if required. With the introduction of the VNX, that changed. Primarily because of the switch from FC to SAS on the back-end. And with the “Next-Generation” VNX (VNX2), you also can’t go from VNX to VNX2. Which some people have been understandably unhappy about. The procedure hasn’t changed much over the years, and you can read Rob’s post here for a pretty thorough look at what’s involved. So why would you want to do this anyway? Especially given that, if you’re upgrading a VNX5200 for example, you’ve probably only had the array in operation for a few years. Well, requirements change, companies grow, people need more horsepower. Sometimes EMC makes it a commercially viable option to do a DIP upgrade rather than replace the array with another one. There’re are a bunch of reasons. I don’t want to go into exactly what the steps are, as your friendly EMC service folk or partner will be able to go through that with you, but I thought it might be an idea to share a few things to know prior to launching into one of these procedures (or even making the decision to upgrade in this fashion). Note that you cannot convert a VNX7600, nor can you go from VNX to VNX2 (as I mentioned before). Also, the VNX8000 can’t be a source system, because that’s already as big as the VNX goes. You can’t convert from a block system to a higher performing unified system. You can, however, do a block conversion, and do a block-to-unified upgrade. It generally takes about six hours to complete a DIP conversion. As always, if you’re considering this approach, talk to EMC about it. I’m surprised that I haven’t done an article on configuring Active Directory (AD) authentication on the VNX. It’s pretty easy to do, and a good idea. Big thanks to Sean Thulin for documenting this in a clear and concise fashion, and to EMC Support‘s website for filling in some of the blanks I had (via Primus emc308583). Firstly, you should have DNS configured on your array. This is just a basic thing that you should do. Stop making excuses. Full path information for the Bind DN, the User container, and the Group container. To obtain this, log in to a Windows computer with dsquery installed. You don’t need Domain Admin rights to get this information. To determine the DC hostname, run set | findstr “LOGONSERVER” to return the hostname. The above is fully qualified path name for the account “ldap_account,” which will be used as the Bind DN. You’ll need access to the password of this service account. The User container is where the VNX will look for the user login be used for authentication. In this example the user name is “Storage User”. C:\Users\dan>dsquery user -name "Storage User"
For the group, you can do the same thing. In a number of environments, this will be the same location as the Users. C:\Users\dan>dsquery group -name "Storage Admins"
Now you’re ready to set things up. 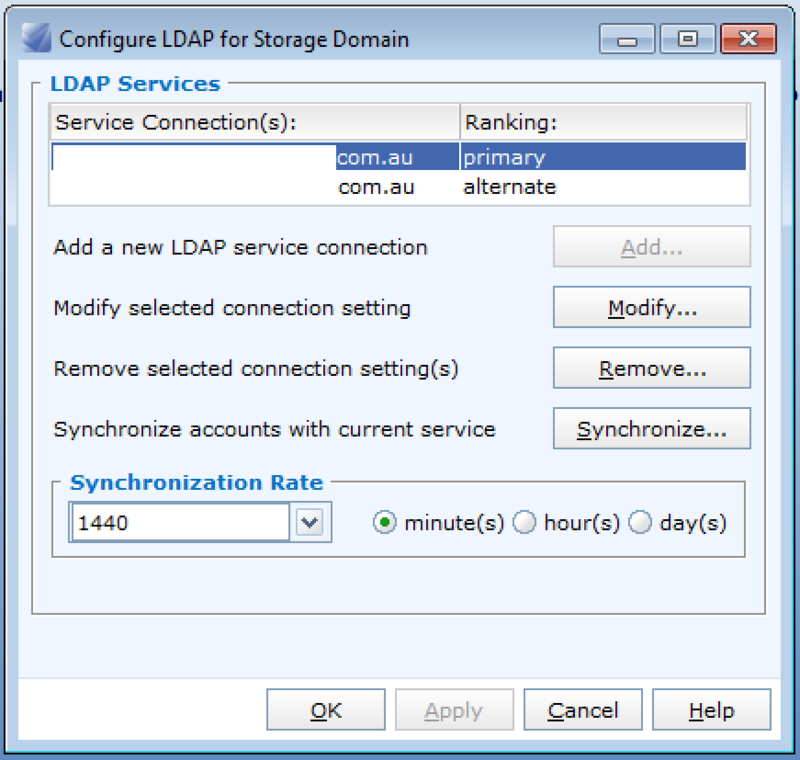 Go to Domain -> Manage LDAP and configure using the above collected information. You can configure two service connections. These would usually be DCs that are at discrete data centres. Click on Add or Modify. 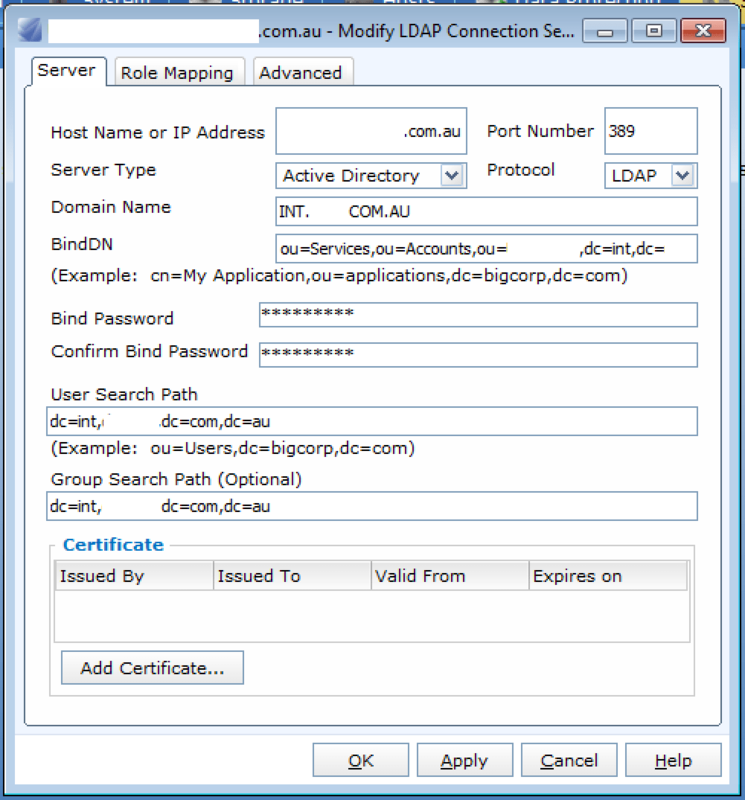 Add certificate – If you’re using LDAPS, you’ll need this. Operator – Read-only privilege for storage and domain operations; no privilege for security operations. Network Administrator – All operator privileges and privileges to configure DNS, IP settings, and SNMP. NAS Administrator – Full privileges for file operations. Operator privileges for block and security operations. SAN Administrator – Full privileges for block operations. Operator privileges for file and security operations. 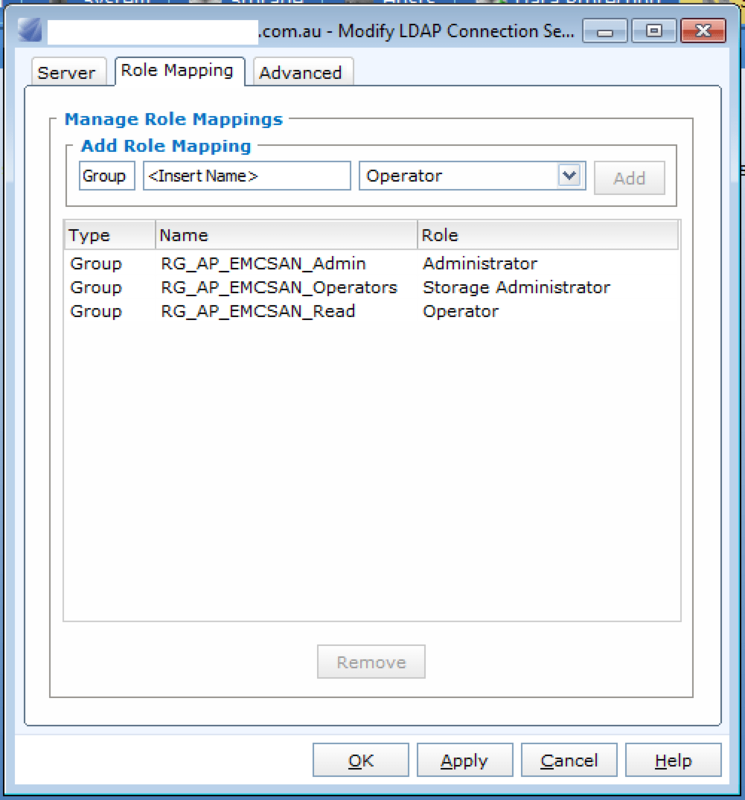 Storage Administrator – Full privileges for file and block operations. Operator privileges for security operations. Security Administrator – Full privileges for security operations including domains. Operator privileges for file and block operations. Administrator – Full privileges for file, block, and security operations. This role is the most privileged role. VM Administrator – Enables you to view and monitor basic storage components of your VNX system through vCenter by using VMware’s vSphere Storage APIs for Storage Awareness (VASA). Note that some of these roles apply to “Unified” configs (NAS), rather than block-only. Don’t forget to synchronise the information once you’ve created the connections. And that’s it. 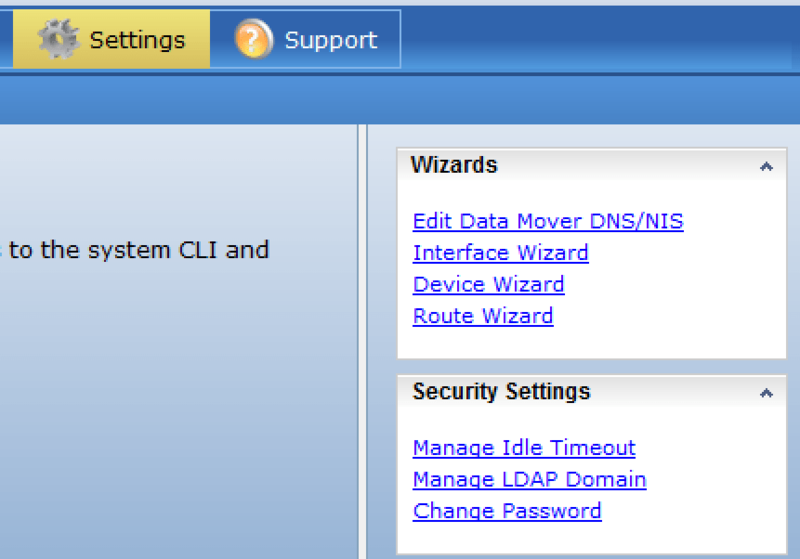 you should now be able to log in to your VNX with your AD credentials. Just make sure “Use LDAP” is ticked. 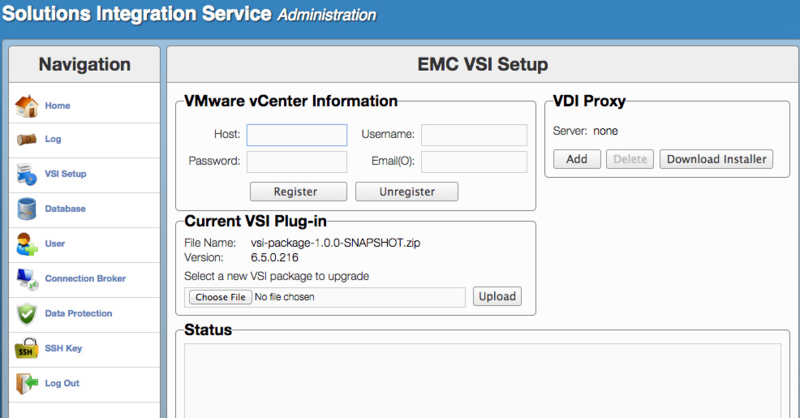 I wrote in a previous post about having some problems with EMC’s VSI for VMware vSphere 6.5 when running in vCenter 5.5 in Linked Mode. I spoke about deploying the appliance in just one site as a workaround. Turns out that wasn’t much of a workaround. Because workaround implies that I was able to get some functionality out of the situation. While the appliance deployed okay, I couldn’t get it to recognise the deployed volumes as EMC volumes. While this strikes me as non-optimal, I am hopeful, but not optimistic, that it will be fixed in a later version. My concern is that Linked Mode isn’t the problem at all, and it’s something else stupid that I’m doing. But I’m short of places I can test this at the moment. If I come across a site where we’re not using Linked Mode, I’ll be sure to fire up the appliance and run it through its paces, but for now it’s back in the box. If you’re a VNX customer you’ve probably heard someone bang on about how easy to use VNX Snapshots are, particularly if they’ve used SnapView in the past. If you’re after the good word on VNX Snapshots, check out this whitepaper from EMC here. Tomek has a reasonable write-up here as well. In any case I’ve been working with a customer on some migration scripts and they wanted to take VNX Snapshots as well as VM snapshots while they update their OS and apps. I wrote about creating SnapView Clones with naviseccli some time ago, but I find VNX Snapshots a shedload easier to work with. This is will, as always, be dictated by your own set of requirements, circumstances and religious beliefs. So here’s what you need to do to get from start to finish. Note that I haven’t covered creating Snapshot Mount Points (SMPs) in this, nor do I talk about using host-based tools such as SnapCLI. I’ll follow up in the future with some words around this. [Update] I forgot to mention @Dynamoxxx / Storage Monkey‘s excellent posts on this subject too – have a look here for Linux and here for Windows. You’ll need to set yourself up if you’re using a fresh installation. You can then create a snapshot of LUN 7 called “testsnap1” which is read/write and will be kept for 4 hours. Unable to validate the identity of the server. There are issues with the certificate presented. Only import this certificate if you have reason to believe it was sent by a trusted source. Would you like to Accept the certificate for this session,  Accept and store,  Reject the certificate? Note that there’s no output from this command. If you want to check out the snapshots you have, you can list them. Want to change the ID of the snapshot or change the autodelete setting? C:\Program Files (x86)\EMC\Navisphere CLI>naviseccli -address 192.168.0.100 snap -modify -id "testsnap1" -name "testsnap2"
Great, now let’s get rid of it. C:\Program Files (x86)\EMC\Navisphere CLI>naviseccli -address 192.168.0.100 snap -destroy -id "testsnap2"
As part of a recent deployment I’ve been implementing EMC VSI for VMware vSphere Web Client v6.5 in a vSphere 5.5 environment. If you’re not familiar with this product, it “enables administrators to view, manage, and optimize storage for VMware ESX/ESXi servers and hosts and then map that storage to the hosts.” It covers a bunch of EMC products, and can be really useful in understanding where your VMs sit in relation to your EMC storage environment. It also really helps non-storage admins get going quickly in an EMC environment. Start adding arrays as required. So this is all pretty straightforward. BTW the default username is admin, and the default password is ChangeMe. You’ll be prompted to change the password the first time you log in to the appliance. So the problem for me arose when I went to register a second SIS appliance. By way of background, there are two vCenter 5.5 U2 instances running at two different data centres. I do, however, have them running in Linked Mode. And I think this is the problem. I know that you can only register one instance at a time with one vCenter. While it’s not an issue to deploy a second appliance at the second DC, every time I go to register the service in vCenter, regardless of where I’m logged in, it always points to the first vCenter instance. Which is a bit of a PITA, and not something I’d expected to be a problem. As a workaround, I’ve deployed one instance of the appliance at the primary DC and added both arrays to it to get the client up and running. And yes, I agree, if I have a site down I’m probably not going to be super focused on storage provisioning activities at my secondary DC. But I do enjoy whinging about things when they don’t work the way I expected them in the first instance. I’d read in previous versions that Linked Mode wasn’t supported, but figured this was no longer an issue as it’s not mentioned in the 6.5 Product Guide. This thread on ECN seems to back up what I suspect. I’d be keen to hear if other people have run into this issue.